Nicholas Roerich was involved throughout his career with the problems of cultural preservation. From an early age, when, as a teen-age amateur archeologist in the north of Russia, he unearthed rare and beautiful ancient artifacts, he realized that the best products of humanity's creative genius were almost always neglected, or even destroyed, by humanity itself. In the earliest years of twentieth century, he traveled through the historic towns of Northern Russia, making paintings of their crumbling walls and deteriorating architecture. He then made appeals to the Russian government for efforts to maintain and restore these priceless links to the past. Later it was the devastations of the first World War and the Russian revolution that spurred his own efforts. He came to realize that the cultural heritage of each nation is in essence a world treasure. And his idea of cultural heritage broadened to include more than just the physical remains of earlier cultures—the buildings and art, for example—but also the creative activities, the universities, the libraries, the hospitals, the concert halls and theaters. All must be protected from the ravages of war and neglect, for without them life would be nothing but a rude and ignorant time on earth. It became clear to Roerich that an international effort was required. During the nineteen-twenties, he composed a treaty with the assistance of international legal experts. This treaty came to be known as The Roerich Pact. The Roerich Pact and Banner of Peace movement grew rapidly during the early nineteen-thirties, with centers in a number of countries. There were three international conferences, in Bruges, Belgium, in Montevideo, Uruguay, and in Washington, D.C. The Pact itself declared the necessity for protection of the cultural product and activity of the world—both during war and peace—and prescribed the method by which all sites of cultural value would be declared neutral and protected, just as the Red Cross does with hospitals. 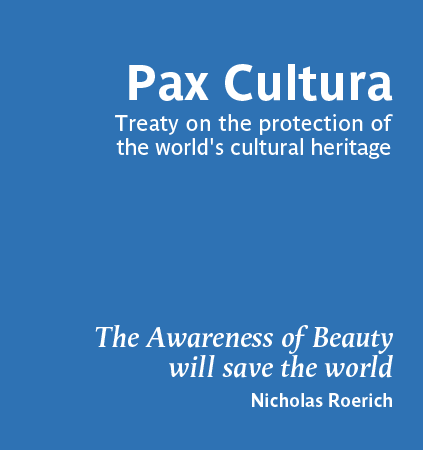 Indeed, the Roerich Pact was often called The Red Cross of Culture. Just as the Red Cross is embodied in a protective sign and banner, so does the Roerich Pact also designate a symbol—the one seen on this page—to be displayed on a banner, The Banner of Peace. This Banner, flown at all sites of cultural activity and historical value, would declare them neutral, independent of combatant forces. The Banner of Peace symbol has ancient origins. Perhaps its earliest known example appears on Stone Age amulets: three dots, without the enclosing circle. Roerich came across numerous later examples in various parts of the world, and knew that it represented a deep and sophisticated understanding of the triune nature of existence. 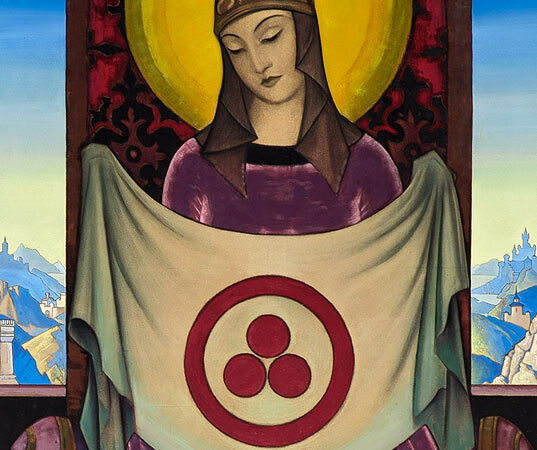 But for the purposes of the Banner and the Pact, Roerich described the circle as representing the totality of culture, with the three dots being Art, Science, and Religion, three of the most embracing of human cultural activities. He also described the circle as representing the eternity of time, encompassing the past, present, and future. The sacred origins of the symbol, as an illustration of the trinities fundamental to all religions, remain central to the meaning of the Pact and the Banner today. The Roerich Pact was first agreed to by twenty-one nations of the Americas and signed as a treaty in the White House, in the presence of President Franklin Delano Roosevelt, on April 15, 1935, by all the members of the Pan-American Union. It was later signed by other countries also. The year 2005 marks the seventieth anniversary of the signing of the Roerich Pact. The history of international treaties shows us how many of them were relevant and applicable to the times in which they were signed, but then lapsed into irrelevance. The Roerich Pact, however, has kept its heart and its life, and is linked to the needs of today’s chaotic world as much as ever. In so many countries we see a deterioration of cultural values and a disregard for the right of all cultural treasures to have their own continued existence, forever protected and unimpeded. We see destruction of life, property, and the inheritance of the creative genius of the nations. One can only hope that a greater awareness of the importance of humanity’s cultural heritage will increase, rather than deteriorate. There is no greater value to a nation than its culture. The historic monuments, museums, scientific, artistic, educational and cultural institutions shall be considered as neutral and as such respected and protected by belligerents. The same respect and protection shall be due to the personnel of the institutions mentioned above. The same respect and protection shall be accorded to the historic monuments, museums, scientific, artistic, educational and cultural institutions in time of peace as well as in war. The neutrality of, and protection and respect due to, the monuments and institutions mentioned in the preceding article, shall be recognized in the entire expanse of territories subject to the sovereignty of each of the signatory and acceding States, without any discrimination as to the State allegiance of said monuments and institutions. The respective Governments agree to adopt the measures of internal legislation necessary to insure said protection and respect. In order to identify the monuments and institutions mentioned in article I, use may be made of a distinctive flag (red circle with a triple red sphere in the circle on a white background) in accordance with the model attached to this treaty. The signatory Governments and those which accede to this treaty, shall send to the Pan American Union, at the time of signature or accession, or at any time thereafter, a list of the monuments and institutions for which they desire the protection agreed to in this treaty. The Pan American Union, when notifying the Governments of signatures or accessions, shall also send the list of monuments and institutions mentioned in this article, and shall inform the other Governments of any changes in said list. The monuments and institutions mentioned in article I shall cease to enjoy the privileges recognized in the present treaty in case they are made use of for military purposes. The States which do not sign the present treaty on the date it is opened for signature, may sign or adhere to it at any time. The instruments of accession, as well as those of ratification and denunciation of the present treaty, shall be deposited with the Pan American Union, which shall communicate notice of the act of deposit to the other signatory or acceding States. The present treaty may be denounced at any time by any of the signatory or acceding States, and the denunciation shall go into effect three months after notice of it has been given to the other signatory or acceding States. IN WITNESS WHEREOF, the Undersigned Plenipotentiaries, after having deposited their full powers found to be in due and proper form, sign this treaty on behalf of their respective governments, and affix thereto their seals, on the dates appearing opposite their signatures. For Peru:M. DE FREYRE Y S.
NOW, THEREFORE be it known that I, Franklin D. Roosevelt, President of the United States of America, have caused the said Treaty to be made public to the end that the same and every article and clause thereof may be observed and fulfilled with good faith by the United States of America and the citizens thereof. IN TESTIMONY WHEREOF, I have caused the Seal of the United States of America to be hereunto affixed. DONE at the city of Washington this twenty-fifth day of October in the year of our Lord one thousand nine hundred and thirty-five, and of the Independence of the United States of America the one hundred and sixtieth. With a view to receiving the advice and consent of the Senate to ratification, I transmit herewith a treaty on the protection of artistic and scientific institutions and historic monuments which was signed in my presence at the White House on April 15, 1935, by the respective plenipotentiaries of the 21 American republics. It was signed for the United States by the Secretary of Agriculture by virtue of a full power issued to him by me. As is stated in the accompanying report of the Secretary of State, the treaty, embodying the "Roerich Pact" which was initiated by the Roerich Museum in the United States, was prepared in its present purpose of carrying out a recommendation made to the governments in a resolution approved on December 16, 1933, by the Seventh International Conference of American States at Montevideo. THE WHITE HOUSE, May 20, 1935. The undersigned, the Secretary of State, has the honor to lay before the President, with a view to its transmission to the Senate to receive the advice and consent of that body to ratification, should his judgment approve thereof, a treaty on the protection of artistic and scientific institutions and historic monuments. This treaty, embodying the "Roerich Pact" which was initiated by the Roerich Museum in the United States, was prepared in its present form by the governing board of the Pan American Union in pursuance of a resolution approved on December 16, 1933, by the Seventh International Conference of American States at Montevideo, and was signed at Washington on April 15, 1935, by the respective plenipotentiaries of the 21 American Republics. The treaty has for its object the protection of historic monuments, museums, scientific, artistic, educational, and cultural institutions both in time of peace and in time of war, and provides for the use of a distinctive flag to identify the monuments and institutions coming within the protection of the treaty.